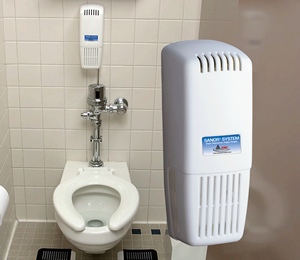 Our Sanor Mark-V Program is a very effective solution to addressing most of your restroom odor's directly at their source, thus, leaving behind an odor-free and fresh smelling washroom 24/7/365. Sanor Mark-V delivers a 100% sustainable offering on multiple levels, featuring a continuous, gravity fed operation with no batteries, delivering a metered, non-hazardous detergent-rich cleaning and fragrancing fluid directly into urinal and toilet bowls, to clean, at, and below the water line. Sanor fluid also provides an aesthetically pleasing fragrance to your entire washroom. Sanor attacks odor's at their source, in the bowls and deep within the waste discharge pipes, penetrating and cleaning areas where janitorial cleaning cannot reach. By the process of cleaning organic soils in the bowls below the water line, Sanor helps prevent odor causing bacteria from developing in the first place while helping maintain free flowing drain lines.